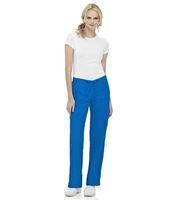 Only the best will do for scrubs-wearing fashionistas like you, and this Landau scrub pant certainly ranks with the best of ‘em! For some va-va-voom style, the pant has a contoured fit at the hips, showing off those enviable curves of yours, and it’s available in tall, regular and petite, so you can rock this pant whatever your shape or size! In the name of comfort, the scrub pant boasts an elastic back and a front drawstring, (which allows you to adjust the fit to your liking,) and what’s more, side vents offer plenty of room for easy movement. A selection of pockets including side pockets and cargo pockets are at your service at all times, and are the perfect place to store medical accessories and personal paraphernalia (including your favorite lip gloss which I know, (trust me!) never leaves your side!). You really can’t go wrong with the 8385 scrub pant; its super stylish look together with its convenient features bring you as close to perfection as you can get!